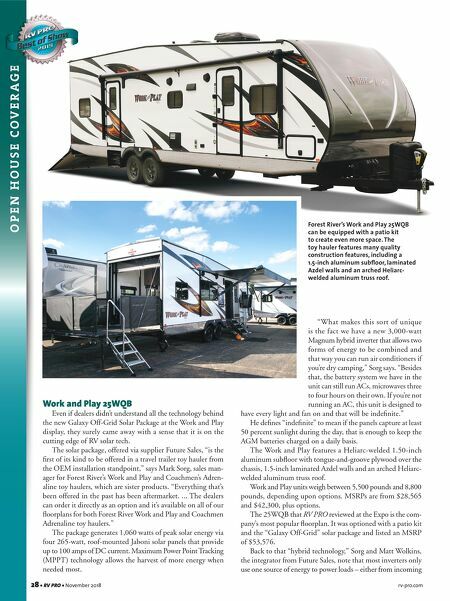 28 • RV PRO • November 2018 rv-pro.com O P E N H O U S E C O V E R A G E Work and Play 25WQB Even if dealers didn't understand all the technology behind the new Galaxy Off-Grid Solar Package at the Work and Play display, they surely came away with a sense that it is on the cutting edge of RV solar tech. The solar package, offered via supplier Future Sales, "is the first of its kind to be offered in a travel trailer toy hauler from the OEM installation standpoint," says Mark Sorg, sales man- ager for Forest River's Work and Play and Coachmen's Adren- aline toy haulers, which are sister products. "Everything that's been offered in the past has been aftermarket. ... The dealers can order it directly as an option and it's available on all of our floorplans for both Forest River Work and Play and Coachmen Adrenaline toy haulers." The package generates 1,060 watts of peak solar energy via four 265-watt, roof-mounted Jaboni solar panels that provide up to 100 amps of DC current. Maximum Power Point Tracking (MPPT) technology allows the harvest of more energy when needed most. "What makes this sort of unique is the fact we have a new 3,000-watt Magnum hybrid inverter that allows two forms of energy to be combined and that way you can run air conditioners if you're dry camping," Sorg says. "Besides that, the battery system we have in the unit can still run ACs, microwaves three to four hours on their own. If you're not running an AC, this unit is designed to have every light and fan on and that will be indefinite." He defines "indefinite" to mean if the panels capture at least 50 percent sunlight during the day, that is enough to keep the AGM batteries charged on a daily basis. The Work and Play features a Heliarc-welded 1.50-inch aluminum subfloor with tongue-and-groove plywood over the chassis, 1.5-inch laminated Azdel walls and an arched Heliarc- welded aluminum truss roof. Work and Play units weigh between 5,500 pounds and 8,800 pounds, depending upon options. MSRPs are from $28,565 and $42,300, plus options. The 25WQB that RV PRO reviewed at the Expo is the com- pany's most popular floorplan. It was optioned with a patio kit and the "Galaxy Off-Grid" solar package and listed an MSRP of $53,576. 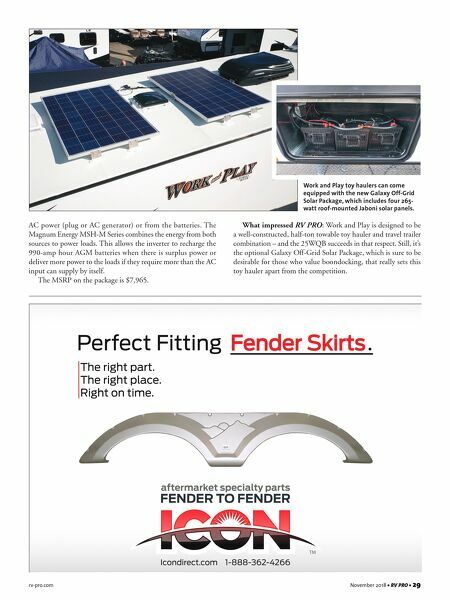 Back to that "hybrid technology," Sorg and Matt Wolkins, the integrator from Future Sales, note that most inverters only use one source of energy to power loads – either from incoming Forest River's Work and Play 25WQB can be equipped with a patio kit to create even more space. The toy hauler features many quality construction features, including a 1.5-inch aluminum subfloor, laminated Azdel walls and an arched Heliarc- welded aluminum truss roof.